Singer Roh Ji Hoon wrote a loving letter to fans on his upcoming marriage to racing model Lee Eun Hye. On April 18, Roh Ji Hoon and Lee Eun Hye announced they were pregnant and preparing to get married next month. A day later, he shared the below photo of their wedding invitation on Instagram with the message, "I have... bad handwriting so. Thank you sincerely for so much interest, love, support, and congratulations. I'll live well and happily." "We met randomly 6 years ago and became friends, then at the end of last year, we started growing romantic feelings for each other. Whether we were friends or lovers, she liked me as the person Roh Ji Hoon, trusted me, and loved me. We'll be making a family together now. As I've only shown you all my young and lacking side, I'll become a more mature and responsible artist, actor, better person, and greater man. Even if the road ahead is covered in thorns, I'm preparing to get married because I've met someone I want to travel it with together. I was able to throw off any fears I had when she said she would always have money to buy me flowers even if she can't spend as much money feeding herself. We'll overcome all hardships together, and I hope we only have the chance to plant beautiful flowers in our future. In the end, I hope we'll walk a path covered in flowers." 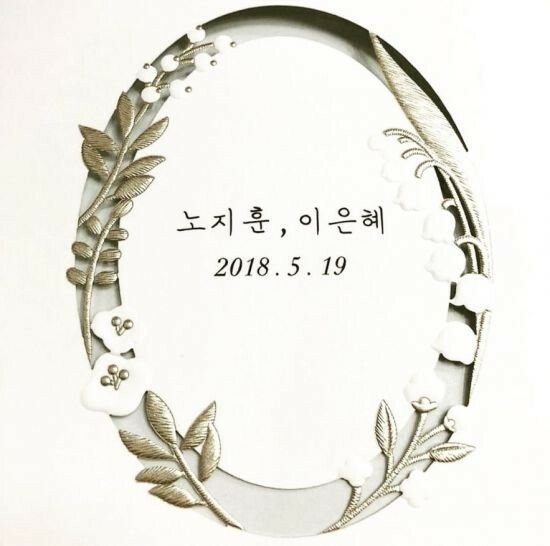 Roh Ji Hoon and Lee Eun Hye are tying the knot on May 19. Congratulations to the couple once again!